From time immemorial, Kazakh craftspersons would manufacture small plastic articles made of stone, bone, ceramics, metal, table-ware molded of clay, cut of wood and leather. Fretwork items made of wood, bone and stone were Quite widespread. They would process and stamp leather and metals, and weave all sorts of mats. Not infrequently , they would create fanciful castings of tin and bronze. Varieties of combat weapons: pale-axes (ai-balta), bows (sadaka), quivers (koramsak) were quite plentiful. Embroidery is well-known in Kazakhstan from ancient times. Embroidered ornaments consist of many multicoloured threads exquisitely embellished with glass beads, pearls, precious stones fastened onto cloth, leather, felt and other materials. Carpet weaving is inseparable from the ancient crafts of Kazakhs. From ancient times till today, SYRMAK, a traditional hand-made carpet decorates the interiors of Kazakh houses. Pressing and stamping leather is the oldest and most widespread form of Kazakh craft. It is difficult to recall any sphere of the Kazakh mode of life where leather as a material is not used. Clothes, footwear, belts, straps, horse harnesses and reins, saddles, arrow quivers, decorative surfaces for trunks, various vessels and utensils, and even carpets were made from leather. Kazakh traditional craftsmen developed and attained very high technological and artistic levels in this form of applied art. Kyrgyzstan was born on the 31st of August, 1991 as a sovereign modern democratic state. Though young in years, it has a rich heritage and cultural continuity that dates back to many thousands years of antiquity and history. Kyrgyzstan is a land of high mountains and a long history of nomads. The Kyrgyz are best known for their amazing ways with felt which is considered by many as the best in the world. Yurtas, shirdaks (quilted carpets), ala kiiz (pressed felt carpets), toys, and household goods are just some of the multitude of felt items handcrafted by Kyrgyz artisans. Placed along the Silk Route on the historic crossroads of trade and cultural exchanges between China, Afghanistan, Iran, Pakistan, India and the Arabian Sea, Kyrgyztan is home for more than minorities and ethnic communities. 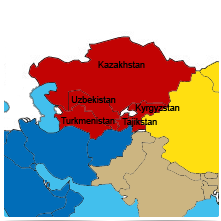 Kyrgyz, Russian, Uzbek, Ukrainan, Germans, Tartars, Kazaks, Uigur and Tadjik. As a multi-national state Kyrgyzstan has a rich variety of languages, literature, folklore, arts, crafts, customs and communities that lend color and variety to Kyrgyz culture. The Kyrgyz Republic firmly upholds the equality of all communities. The official language is Kyrgyz yet Russian forms a common language of all groups. Tajikistan is famous for golden embroidery, colorful textiles, and fun toys. The Tajik artisans are very enthusiastic and produce a large number of craft items using both traditional and modern techniques. Textiles are the main handicraft items of the country. Turkmenistan’s tribes have inherited a unique blend of nomadic and city cultures of the Silk Road and preserved extraordinary traditions in carpet making, weaving, embroidery and jewellery. Even today, Nokhur women weave beautiful Keteni Silks, Teke-Tribe families knit the famous Akhal Teke or Bukhara Rugs, and Ersari families create fascinating Yaka and Chirpy Embroidery clearly identifying their clan. Tamdyr oven chorek bread and Somsa making is still practised as a traditional craft. The Yomud people reflect their tribal patterns in their enormous Koshma felts. Turkmen silk and embroidery are outstanding within Central Asia, with each different pattern identifying the clan and tribe of its artist like a family seal. The raw silk is dyed with natural and artificial dyes, threaded and with the help of family and neighbours prepared and woven into colourful, hard 30 cm wide silk used for the dresses worn by Turkmen women on special occasions. Uzbek applied arts has a wealth of variety when it comes to style, materials and ornamentation. Ceramics, silk and cotton weaving, stone and wood carving, metal engraving, leather stamping, calligraphy and miniature painting are some genres passed from ancient times. Ceramics of Uzbekistan are very diverse in their colour and design. They are also regional in terms of shape, design and colour. During the second half of the 20th century, miniature plastic toys made by Samarkand craftsmen became very popular. These pieces were not only amusing as toys; they are also depicted scenes filled with people’s characteristics, humour and naive stories. Another kind of Uzbek craft typical for Samarkand is the art of making crockery, smoking pipes (chilim) and snuffboxes (noskadu) from little gourds. Uzbek craftsmen of today still practice ancient jewellery making techniques for cutting gemstones, grain filigree, granular work, engraving, embossing, chasing and enamelling. Modern jewellers not only keep traditions, they also take into account fashion demands and styles. One of the most popular trends of applied arts in Uzbekistan is embroidery. The several areas in Uzbekistan famous for their embroidery are Nuratin, Samarkand, Bukhara, Shakhrisabz, Surbandarya, Tashkent, Djizzak and Fergana. Each school is distinguished by its unique features such as ornamentation, composition, colour range and stitching.